Treatment of intraosseous meningiomas primarily involves resection with wide margins. Ideally cranial reconstruction is performed during the same procedure. Since this procedure often also requires removing part of the orbit, reconstruction with a patient specific implant is highly desirable to achieve cosmetic repair. Also with the use of CT imaging, digital 3D modeling, 3D printing and design and virtual surgical planning, such a procedure can be pre-planned and executed to a high degree of accuracy in one single procedure, with the help of a 3D printed surgical cutting guide and patient specific implant. 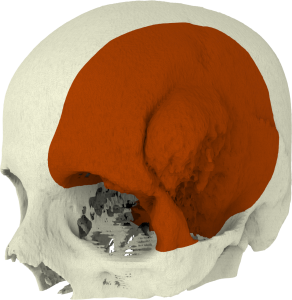 CT data is converted to a digital 3D model of the skull. 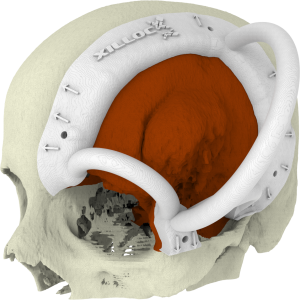 In our online ordering system MedX the surgeon can interactively review this 3D model and indicates the margins for resection. Together with the surgeon our biomedical engineers make a virtual resection of the skull with the meningioma. To accurately transfer the virtual resection to the OR, a surgical cutting guide is designed and 3D printed. 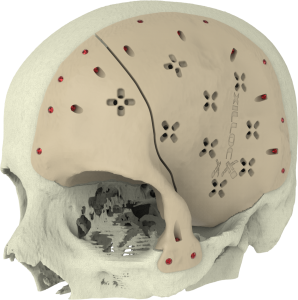 This cutting guide fits perfectly on the skull (and the orbit) on or around the meningioma and indicates the outline of the planned resection area. The design of the cutting guide also takes into account the specific tool(s) the surgeon wants to use for the resection. For example the surgeon can choose to use a traditional craniectome or a piezoelectric saw. Since the defect size is known beforehand, a patient specific implants is designed in parallel with the steps above. The implant design is of course based on shape of the original bone and mirroring can be employed as well. This custom implant reconstructs the skull perfectly; it fits exactly in the defect and provides a perfect reconstruction. Fixation of the implant is done using our tangential fixation method InterFix and the temporal muscle can be attached to XSuture. Uniquely in this case the surgeon opted for a two-piece design of the implant; an orbita part and a temporal part. The reason for this was that if he ever needed to open the defect again, for whatever reason, he can keep the orbita part in place. Patients who receive immediate reconstruction are neurologically stable especially in contrast to patients who have a skull defect. This positive effect is seen a lot in patients who receive skull reconstruction and is generally attributed to a restoration in intracranial pressure and its effect on cerebrospinal fluid flow. Our PEEK implants are designed to mimic the original bone thickness and are thus expected to optimally restore the pressure underneath the implant (in contrast to titanium mesh reconstruction). This will benefit the patient in recovery.